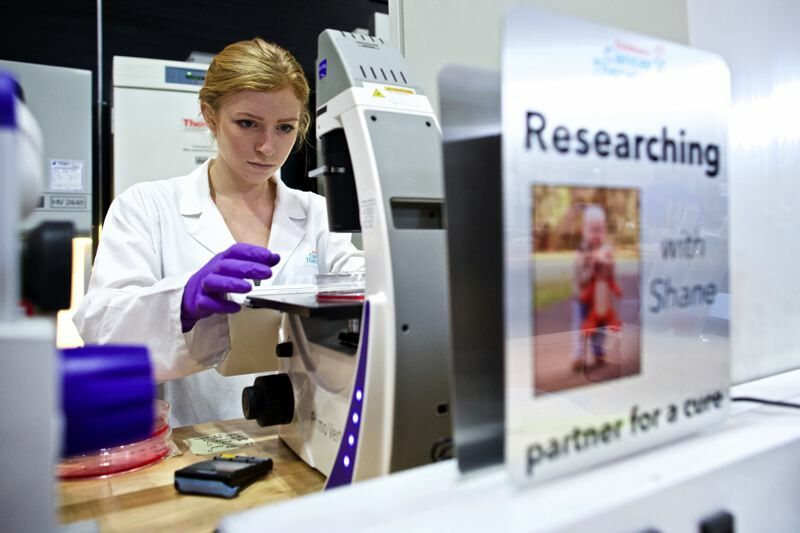 Beyond an unmarked door into what looks like a shabby old warehouse in Old Town Beaverton, white-coated scientists are working to find ways to treat cancers that kill almost every child they afflict. The Children's Cancer Therapy Development Institute arrived in Beaverton only 11 months ago, but its staff is right at home in its Old Town digs, a building whose shell still looks like the paint company it once housed but whose interior reflects more of the funkiness that Nike infused when it transformed the spot into a hidden creative space. More importantly, this is a place where researchers will pit multiple drug therapies against the types of cancers that kill kids, looking for silver bullets in fights that are still far from won. These are cancers including Rhabdomyosarcoma, or RMS, a cancer of the muscles that fewer than a fifth of young patients survive if it has already spread through the body. Then theres Diffuse Intrinsic Pontine Glioma, or DIPG, a brain stem cancer that no child has ever survived. They also try to address Medulloblastoma, another brain cancer that allows only about a third of stricken children to reach adulthood. But The Childrens Cancer Therapy Development Institute just got some new ammunition in the fight against Medulloblastoma, the most common metastatic brain cancer. The St. Baldrick's Foundation, a private charity that focuses on childhood cancers, recently awarded a $174,000 grant that the Beaverton institute will aim at Medulloblastoma. It was the only funding awarded to Oregon researchers in St. Baldricks recently announced round of 79 grants. Morgann Turkot, a biomedical engineering fellow, joined the Beaverton lab in recent weeks to begin work on Medulloblastoma therapies under the two-year grant. This is a homecoming of sorts because Turkot grew up in Hillsboro and graduated from Catlin Gabel School near Beaverton. We hope it will find an appropriate treatment for these children, she said. Berlow said that grants from St. Baldricks and other private foundations and public sources, as well as donations, are essential to bringing in the scientists to perform the multi-stage studies necessary to find effective cures for devastating diseases. Veteran cancer researcher Dr. Charles Keller founded the institute in Fort Collins, Colo., early last year but soon moved the lab to Beaverton to be closer to Intel, which its leadership sees as a key collaborator to help with the incredibly complex computational work that goes along with testing and proving new therapies. The relationship runs deep, as one of the institutes board members is a former vice president at Intel. Keller, the labs scientific director, has other local ties as a former pediatric cancer biologist at Oregon Health & Science University. 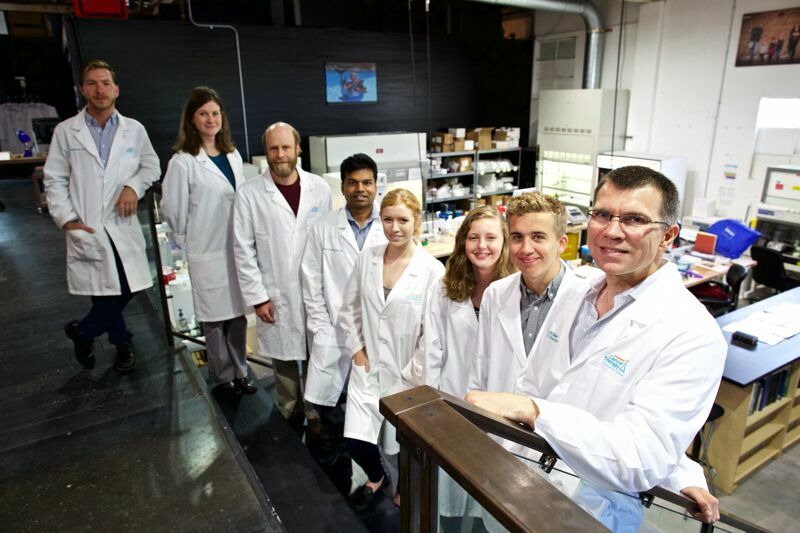 But Berlow said the Beaverton lab intentionally operates independently of a university because the scientists can be more nimble and focused on researching cures. The Childrens Cancer Therapy Development Institute also works closely with families touched by childhood cancers and even welcomes non-scientists into the lab to help with what for them is a collaborative process, Berlow said. And while the real work happens under microscopes and in advanced studies with experiments involving mice, the untraditional lab space also speaks to the institutes mission, Berlow said. The building includes a special phone booth reminiscent of the Tardis in the Doctor Who TV series, giving a tiny rectangle of quiet where people can have cellphone conversations insulated from the otherwise echoing warehouse. A living room-like area provides another refuge that seems far removed from a sterile laboratory. Besides the institute, the location also rents space to other small biomedical and technology companies, bringing more smart people into the space and fostering collaboration, Berlow said. Two such firms already are located there.